Jimbaran bay, the sea side resort, not far from Ngurah Rai airport, just 10 minutes drive, you can even see the airplanes when they’re landing. Pretty crazy right? But this is really true. 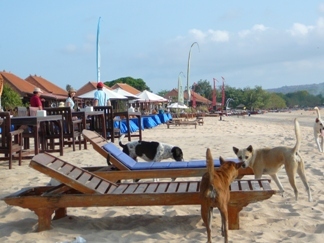 The place is much quieter than Kuta , and if you’re not a party type, this is the right place for you. This is also the place of great seafood. Very famous all over Bali. Along the coast there are countless seafood restaurant. You can enjoy the grilled sea food at the beach. Sometimes your feet can get wet while you’re waiting of your order at the restaurant. The best place to spend your evening with beautiful and romantic sunset and cool breeze of the ocean , while you’re enjoying your diner. And that moment would be last forever. The sight that you won’t forget for the rest of your life. And you want experience the sight one more time, again and again , a delightful evening. 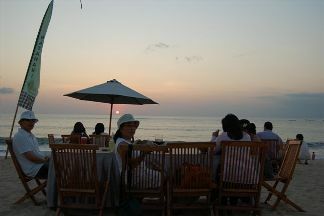 Enjoy the delightful evening on the beach while you're waiting of your diner, sounds great, right?? 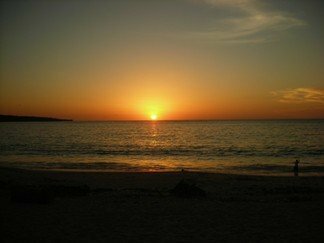 The beach is a beautiful bay with white gold sands and they have great villas with the stunning view of the ocean. Jimbaran is also one of the best hotels in Bali which offers very luxury resort. This beach offer plenty of watersports and activities. But it's not a nice place to do some diving. 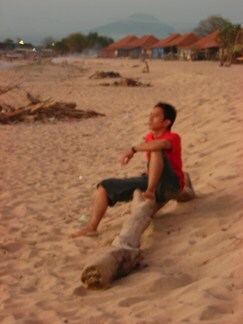 If you’re really intend to do that, go to Nusa Dua beach or Benoa, they have excellent places. Nusa Dua has clear water, very suitable to do diving. There are a lot of bali beach resort around this bay, so you don't have to worry about your staying during your bali vacations. Take for example , Jimbaran Puri Bali a luxury Orient-Express resort hotel at the soft sands of Jimbaran Bay in Bali. They can offer you a luxury and nice staying.